Here are 4 free Windows 8 Facebook client apps that allow you to experience your Facebook account on the very new Windows 8 screen. You can view you Facebook feeds, check notifications, events, pages, see photos, update your Facebook status, post photos, and do everything you are used to. Facebook Touch is a free Windows 8 Facebook client app that lets you have an optimized Facebook experience on your newly installed Windows 8 screen. You can easily access all your Facebook news feed, view Facebook users’ profiles, compose message, reply to messages, check events on Facebook, check your Facebook notifications, see your friends list, search for people, fan pages, and groups. As you open the app, you will be first asked you login to your Facebook account, get authentication of using the app, and then finally start accessing your Facebook feeds. You need to right-click anywhere on the screen and instantly, you will find all the controls lay down on a big horizontal bar at the top of the screen. You can easily send messages, update your Facebook status, post photos, create album, Refresh your wall page, or simply log out. It’s a good utility app to access your Facebook account without heading over to any browser. 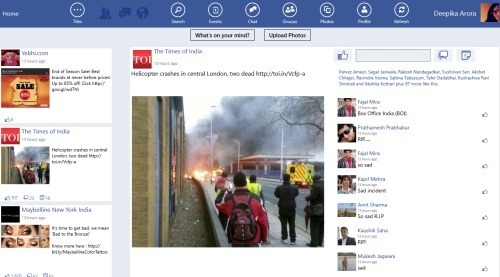 Go ahead and download Facebook Touch app in Windows 8 now. Facebook+ Lite is another Facebook client Windows 8 app that allows you to have a fast and inclusive experience of Facebook on your new Windows 8 screen. You can easily interact with your Facebook feed, view photos, check out friends’ feeds, share photos with others, comment on photos, ‘Like’ the, or just everything you would expect from an advanced Facebook client app. Let me make it very clear that it’s NOT an official Facebook client app. 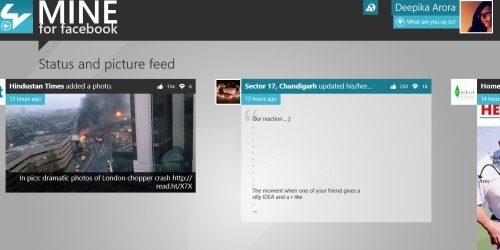 Below given are some key features of this Windows 8 Facebook client app. Lets you access your Facebook account on Windows 8 screen. Lets you view photos, check friends’ updated statuses, interact with your Facebook feed, share photos using Share Charm, etc..
You can easily update your Facebook status, ‘Like’ photos, ‘Comment’ on them.. like the way you are used to. 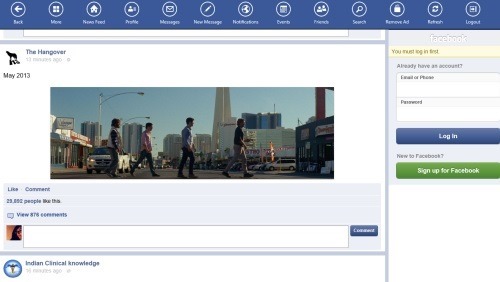 You can easily send messages, check notifications, check FB events, your invites, friend’s request, and more. Easily post multiple photos, from within the app. Well.. all in all I found this Facebook+ Lite app very interesting to experience your Facebook account on Windows 8 screen, and that too without touching any browser. 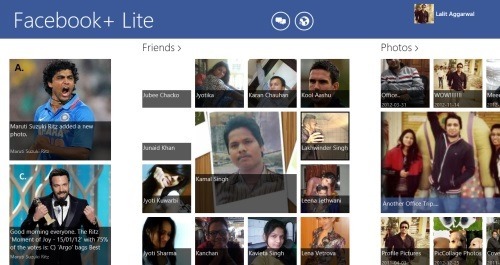 Go ahead and download Facebook+ Lite app in Windows 8 now. Also, check out our posts on Social Networking Apps, Instagram Client Apps, and Pinterest App. Facebook Friends+ lets you navigate you Facebook account in a fast and fluid fashion. The app comes in two different styles of navigate your Facebook feed: Tiles and List. Tiles style displays the feed in tiles and you need to scroll towards the right, in order to view old feeds and on the other hand List style displays all your Facebook feed in a list at the extreme left. As you click on a feed, a photo, or on a status, it will load on the right-side (the bigger side) where you can see its details and like it, comment on it, share it to your FB wall, see people who have commented, etc. At the top of the screen, you will find options such as Search, Events, Chat, Groups, Photos, Profile, and Refresh. To view you own profile, just click on your image given at the top right corner. Here, you will find your Bio, your photos, friends, Likes, groups, books, movies, music.. just everything related to you. Go ahead and download Facebook Friends+ app in Windows 8 now. MINE for Facebook is my favorite among all the Windows 8 Facebook client apps that shows your Facebook feed in a more advanced way. Definitely, you would be able to view your Facebook timeline, updated posts, photo albums, groups, events, fan pages, and just everything you would expect from an advanced Facebook client. The interesting thing is that you can move a step further and customize your Facebook experience.. yup, you can choose what exactly do you want to see in your Facebook feed. You can also add or remove a custom feed (right-click on the screen to get that option), describe you feed, select specific friends.. basically customize till it fits your needs. You need to right-click anywhere on the screen to open the navigation menu including Home, Story feed, Notifications, Friends, Manage Feeds, Groups, and Events. The home page of the app shows ‘Your Personalized Feeds’. It’s a good Facebook client app. I loved this one. Try once .. Download MINE for Facebook app in Windows 8.